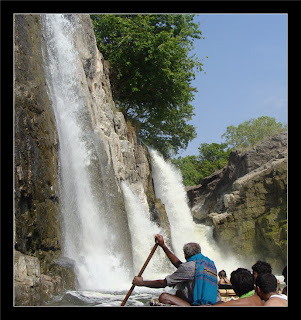 Hogenakkal Falls ~ The Wandering Soul's Wander Tales..
And so it was a long weekend again! March 27th – 29th ’09. The scorching summer heat was totally getting on my nerves and all I could think was water..water..water.. which culminated in us taking a trip to the gorgeous Hogenakkal falls that weekend. As is turns out summer heat continued to wreak its havoc however the falls itself totally made up for that! Hogenakkal translates to Smoking Rocks. Well the water here falls with such force they create the illusion of smoking rocks. 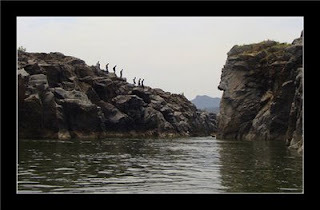 Hogenakkal falls on Cauvery River in Dharmapuri District of Tamilnadu are a whole series of waterfalls spread over an area of one Kilometer approximately. The water falls over on one side into a gorge some 20m deep and there is another gorge which is the downstream of the river. An idyllic place for a perfect weekend day out! The water here is believed to have curative powers as it passes through some forests with medicinal herbs. Curative or not, it sure was rejuvenating as hell! 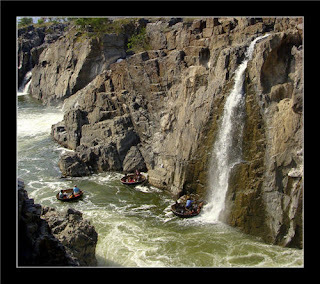 Hogenakkal is approximately 180 kms from Bangalore. There are two routes to reach the place and we chose the longer route which goes through Krishnagiri and Dharmapuri. It takes four hours to drive down to the place. We hired a cab and we were stated off from Bangalore by 6.30 A.M. The road was pretty good. Smooth drive all along. By 10.30 A.M. we reached Hogenakkal. There is a small settlement around the falls where one can find some local hotels and Tamilnadu state Guesthouse in case one decides to stay overnight. There is no other way to see the WaterFalls other than going in a coracle. 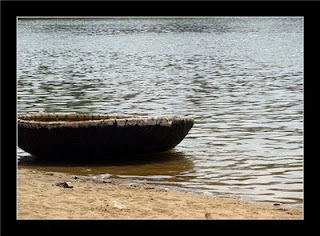 A coracle is a round bamboo boat which is lined with animal hide/canvas and tar at the bottom used in South India mostly. The river falls into a gorge and we are right on top of it hence one needs to get down to the gorge to get a view of the magnificent falls. These coracle guys ask outrageous rates for a boat ride as the tourists have no other option. But some heavy bargaining can get the price considerably down. We ourselves managed only to get the price down to 250rs per head for some 4 hours. Now you would be wondering what we did for four hours with the coracle. Well firstly he will take you to the waterfalls. 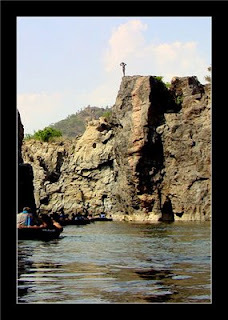 After a delightful drench in the curative waterfalls, the local boys will put up a diving show for Rs. 10 a dive (on request of course!). And then comes the best part, fried fish and rice. The coracle guy took us to the river bank on the downstream side of the river where local people have set up a makeshift market. All along the river one can find lots of locals idling on the rocks fishing for fish. Here they catch fish and fry it for you. They also serve this with rice if interested. Well the fish totally blew us off! It was amazing. I don’t know if the fish were actually so good or the rustic village charm caught upon us. But it was awesome and we stuffed ourselves with fish enough for a month! All ye Non-Vegetarians, do not miss it and All ye Vegetarians, definitely give it a miss! The place invariably smells of fish. After a hearty lunch, we headed to another place a few meters ahead of us where the river is shallow and makes up for a good place to play in the water. If you have come so far, what’s the point if you don’t indulge a bit! We played in the curative waters for nearly an hour. The sun was still scorching but the water was so fresh and clear, we didn’t feel like getting out of it. The coracle guy, now fed up of our crazy antics wanted to takes us back and so we reluctantly got out and we were back on our way to the main entrance. It was well past 3 ‘O Clock and now sitting in the coracle we were feeling the full force of the heat. A bunch of people in a passing coracle were using umbrellas to escape the heat- relaxing no matter what! It was quite a scene. By 3.30 PM our ride was done for good. Back on the top, there is a watch tower at a small height which offers quite a view of the falls and the surroundings. Don’t know if the keepers of the watch tower are self-appointed or Govt.-appointed, but they charge Rs.2 to go up. So we obliged to get a nice aerial view. A couple of more shots and we were leaving Hogenakkal by 4 PM. Toilet Facilities : Govt. run facilities available which are decent. Coracle : is it possible to avoid the coracles and see the falls? No! @Asha - you said it! the real story of four idiots who paid 150 bucks for an AC restroom.. LOL! atlast a list of articles huh! good good..
@ Shaan - Thank you.. :) Oh, it is a wonderful place indeed. I am sure you guys will also have fun. and just to give you a heads-up, now the water levels must be much higher than what i saw in the peak of summer. My freinds and me are planning to hit the summer heat and landing in there, is it a good idea? ## Joyce - sure.. just keep in mind that it is still going to be scorching outside. But I guess that shouldn't matter as you will be in water most of the time. can anyone tell me how is the other route (shorter route) as said above to drive in a car? ?